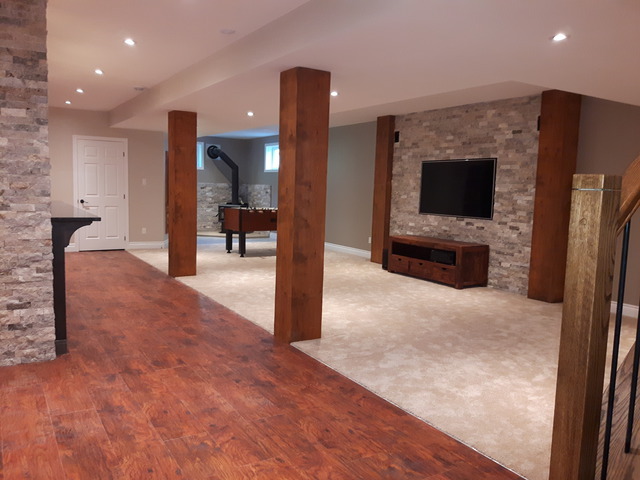 6 months ago we invited Jeff Hayes to quote us on finishing our 2000 sq ft. basement. Up to that point, half a dozen contractors had been in but they all gave us the polished sales pitch with huge price tags. Jeff, on the other hand, was not like the others. He is not just the general contractor, but also gets his hands dirty on the job. He was friendly and confident; he knew exactly the design look we wanted and gave us a very reasonable quote. He was worth the 6 month wait in order to have EXACTLY the look and quality we wanted. Jeff walked us through the initial steps of the renovation and handled any changes we threw at him without hesitation. His crew of 4 showed up on time and worked hard for weeks to accomplish the project. Communication flowed freely between us; we were constantly informed of what work took place that day and what was to come. The progress billing was clear for us to follow and we always knew we were paying for work/supplies that had been done, not pending. Our basement vision quickly took shape: 'reclaimed, warm and natural". Jeff literally made the timber beams which perfectly compliment the natural stone, custom firewood niche, aged bronze fixtures and smoke-toned custom bar. In the end, we are left with an amazing lower living space that our family will enjoy for decades. 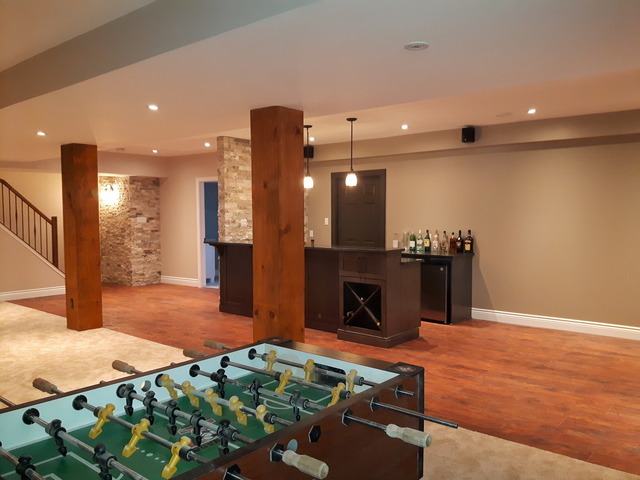 Jeff, Adam: thank you for building our dream basement! We will definitely be contacting you for any future projects. Thanks guys. It was a total pleasure working with you to create our new flagship basement.